A state of emergency was declared in parts of North Sinai after at least 31 members of the Egyptian security forces were killed in two separate attacks in the governorate on Friday. Twenty-eight soldiers were killed – according to the latest figures reported by local satellite channel CBC – and another 30 injured when a car bomb exploded at the Karm Alkwadis security checkpoint in Sheikh Zuweid. Just hours later three security personal died when militants opened fire at a checkpoint in nearby Al-Arish. President Abdel-Fattah El-Sisi declared a state of emergency in the governorate after meeting with the National Defence Council for several hours. The state of emergency will last for three months and will include a daily curfew from 5pm to 7am until further notice. The attack in Sheikh Zuweid is the deadliest the region has seen in more than two years of heightened unrest. There was no immediate claim of responsibility for the attacks. Ansar Beit Al-Maqdis, an Al-Qaeda-inspired Islamist militant group, has previously claimed responsibility for similar attacks in Sinai and in Egypt's mainland. 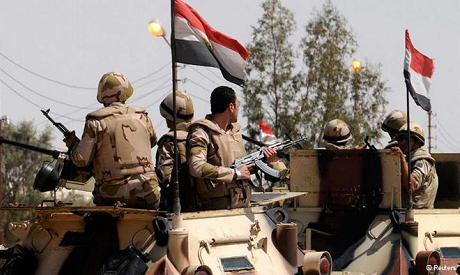 The injured were transferred to the military and general hospitals in Al-Arish, the biggest city in North Sinai. Al-Arish general hospital called on local residents to donate blood. Egyptian authorities also closed the Rafah border crossing with Gaza. Over 40 security personnel have been killed in attacks in the Sinai Peninsula this week, including the two attacks on Friday. A militant insurgency by jihadist groups in the peninsula has become more active since the ouster of Islamist president Mohamed Morsi in 2013. Hundreds of police and soldiers, as well as militants, have been killed. The solution is political firt, political second. and political third. A regime that has excluded 60% of Egyptians from the political process should be ready for such developments. People, not all of them, are now demanding the return of the Islamists. That is why the regime is reluctant to hold parliamentary elections. a matter of time for these beasts to blow up a train or a hotel full of tourists. My condolence to the Egyptian people, and its military personal defending its integrity against enemy within and outside(no reference given to MB). This enemy of men will perish from the face of this earth soon. WE WILL FIND THEM......WE WILL HANG THEM.....WE WILL BURY THEM WHERE THEY BELONG..Fee El-Zebala...PERIOD. I cannot understand, when the security forces will be reliable and take serious action to stop the constant murder of young soldiers. The Egyptians high commando are incomptance and should be replaced by military leaders, who knows how to deal with terrorists and destroy them. Egypt does not need military leaders, who are good at ceremonial duties. Egyptians leaders must follow the Israel example and give the murderous and the terrorists no chance what so ever. The area where the terrorists operate must be wiped out regardless. The Egyptian military leaders neglect their duties and should be accountable for their pathetic behaviour and incompetent. Also all the political prisoners, who commented no violence should be released and the prisoners who violated the protest law should let go free with any newspaper reporters, enough is enough. Egypt needs democracy and less prisoners, the president and the government must improve the economy and the security or have the dignity and resign. Army of any country is primarily responsible for the security of the boarders,its people and its own soldiers.The Army paid by th state at the expsens of public taxes.Hence Army's main tast to focus on security and they are not being paid to rule on public.Whenever an Army involves in the politics and started Govt and civilian tasts in their hands then they loose focus on their prime responsibility.Egyptian Army must undertand that engough is enough , in veiw rapidly changing regional security developments they should focus on security not on Polictics.They should quit politics and get take their responsibilities.Let the politics to civilians who are the ones to decide how run the country. This is sisi policie this is a result those peace full protesters has been killed by Egyptian army . This is very sad and tragic NOT a moment of joy or mockery.If a civilian protester is killed by the police /army or a policeman/Army officer is killed by terrorist all the human beings & all are egyptians.The fact is human and egyptian are being killed.We must understand that Force and violance will not resolve any issue and it will only bring more violance and more bloodshed.This the time to all Egyptian in general and all those in power i.e Army,Judiciary before Egypt become next Afghanistan, Iraq or Somalia. So you as an Muslim brotherhood are openly advocating terror against Egypt and the Egyptian Army. The Muslim brotherhood terrorists were never peaceful so you are not fooling anyone. Rather pathetic you find anything to laugh about, but typical.